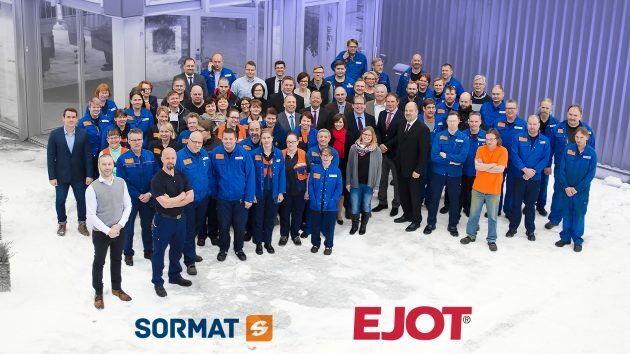 By acquiring Sormat, headquartered in Rusko, Finland, the EJOT Group is strengthening its competence in the area of anchoring technology. Sormat is one of the leading manufacturers of fastening and anchoring products in Northern Europe and employs nearly 80 people. “We see this acquisition as a further development of the Building Fasteners business unit, opening up new fields of application and target groups in the construction industry,” says Christian Kocherscheidt, CEO and Shareholder of the EJOT group. Sormat Oy will continue operating as an independent subsidiary under the current management. “This acquisition continues the recent positive influence of German companies to the industries in South-West Finland. We are committed here at Sormat to develop our products, our manufacturing and international distribution to the new level as a member of the EJOT Group,” says Ismo Laitakari, Managing Director of Sormat. The EJOT Group, headquartered in Westphalian Bad Berleburg, Germany, combines medium-sized companies in the field of connection technology. This also includes the EJOT Baubefestigungen GmbH, headquartered in Bad Laasphe. Founded in 1922 as a screw factory, the EJOT Group now distributes its products in more than 100 countries with 32 international subsidiaries. The EJOT customers are primarily from the automotive and supplier industry as well as the construction industry. EJOT Baubefestigungen GmbH is the headquarter of the activities of the Construction Division, which develops and markets high-quality fastening solutions for the construction industry. The construction products are manufactured in the same factories as certified to the highest quality standards of the international automotive industry. New S-CSA concrete screws are now available! Fastener Fair was a great success! Season’s Greetings from the folks at Sormat! AAC classification in use for aerated concrete loads! Sormat’s customer satisfaction receives top marks! Selection of 4-cutter drill bits gets bigger than ever! ITH-Pe is an ETA-approved resin for masonry!